NOTE: This site is for information/research purposes only. The records listed here are not for sale. This database driven design went online March 5, 2008. Here are postings from 2008 and 2009 listing changes to the website or additions to the database. For more current postings, please CLICK HERE. Statistics: 1494 record labels, 7079 individual records, 6700 images of labels, sleeves, artists, etc. Two large record labels have had a significant makeover this month. They are Harry Glenn's Glenn label (thanks to great effort by Paul Solarski) and Cincinnati's Ark label. Both labels have each had about 100 new images added and many corrections to titles, musical style, etc. Tela-Star, Huber and MMP have also had signficant additions of listings or images. Newly listed local labels include: Aquarius, Circa, Clear Mood, Down Town, Freedom, Fulfillment, Gigantic, Grog, In Synch, Kandun, Karat, L & M, Lamp, Master (Dayton), Midas, Rye, Spiritual (KY), Sunset (KY), Together, Troutman Bros, TTE and Velvet Bullet. Newly listed out of area labels include: Arlee, Country Boy, Golden Triangle, Kay (VA) and Progressive Sound. Thanks again to everyone and Happy Holidays! Statistics: 1467 record labels, 7023 individual records, 6472 images of labels, sleeves, artists, etc. 7000 individual record listings have now been reached in the online database! Images are constantly being added to the site. If you have enabled Java on your computer, you will be able to view the images by clicking on the label scan camera image or the picture sleeve / artist image . I'm currently in the process of adding 100+ images to Cincinnati's Ark label. Also just added 20 more images to the Cozy label. Also made significant additions to Bridges, M Records and Rains. Also added Kay Bank of Minneapolis, Minnesota as one of the tracked pressing plants where local labels were pressed. Pams Productions of Dallas, Texas created a series of "My Home Town" records for local communities. The records were sponsored by radio stations or other groups and were sold in the local communities frequently as a charity fundraiser or radio station promo. The following were pressed locally by Rite records: Evansville, WHLO, KVLC, KCRS, Washington DC, 91-derful Presents, Fort Worth Texas, KOGT, KBWD, WTAW, and WICE. You can look these up on the Label Search page. Newly listed local labels include: Century (Fairmont), Clark Country, Crescendo (WV), Dawn, Easy Prize, Evansville, Matthew Justice, Mo-Soul, Ohio, Ozark, Play, Rescue Hour, Sapphire, WHLO and Windsong. Newly listed out of area labels include: 91-derful Presents, Boss Label, EGM, Express, Fort Worth Texas, Gusman, H.G.P., Jacob-Carle, KBWD, KCRS, KOGT, KVLC, Mart, Masters Quartet, Manford, Memory, Munro, North American, Old Homestead, Orchid, Panorama, Playhouse, RAP, Vaden, Washington DC, WICE and WTAW. Statistics: 1425 record labels, 6927 individual records, 6260 images of labels, sleeves, artists, etc. I've been pretty busy on the site the last month with lots of new additions, updates and corrections. Additional images and/or listings have been added to the following local labels: Acorn, Admiral, Alcar, Alvic, Arc, Athena, Big 4 Hits, Buzz, Canton, Coast To Coast, Cosmic, Cozy, Farrall, Finch, Fujimo, Gateway Series, Gateway Top Tunes, GC, Green River, Hilltop, Jewel, Kernel, Lemco, Melody Guy, New Colony, Out-House, REM, Sun-Ray. Newly listed local labels include: B Racker, Bo-An, Ferrell, Gale, Paro, Shur N Tel, Timber and Top Tunes. Newly listed out of area labels include: Creed, Dynamic Traveleers, Guinn, Heavens Isle, Key West, Little Nashville, Mother Cleo, MRC (VA), Phart, Q-T, Scepter and Space (GA). Thanks again to all who have contributed images, listings and more to this site. I'm behind about 1000+ images at this point but I'm working on it steadily. You keep sending stuff and I'll keep typing it! Lots of additional label images have been added to the Whirl label from Cleveland, Ohio. Quite a few seldom seen images are included so please check it out! Statistics: 1405 record labels, 6827 individual records, 6010 images of labels, sleeves, artists, etc. Lots of new labels, images and listings on the site recently. The Cozy label from Davis, West Virginia has been updated with about 50 additional images - many of which have never been published online previously! Also, Cincinnati's Lucky label now has images of all releases posted. New local labels added recently include: Arrow (OH), Astral 7, Band, Bell Enterprises, Benjon Music, Circle E, Dee-Jay, Del-Nita, Doc, Emery, Gee Gee, Hamlin Town, Scene, Southern Cross, Spotlight, Star Track, Sundown, Thoroughbred and Tiretown. Pertinent out of area labels added recently are: Arco, Artistic, AX, Barc, Bay State, Bee (PA), Bejay, Bellwood, Benjo, Bet-T, Big Red, Blanden, Bootheel, Chapel, Christ Temple, Country Jubilee, Earth, Erie County, Future, Greenwood, Hammer Hits, Honey (CO), Kris, Larry Richardson, Lee (FL), Men-Del, Monumental, Pine Tree (TN), Rend, Rim, Star Spin, Twilight (VA), Universal Artists, Vaca, Vamalco and Velgo. Still lots of catching up to go but I'm typing in steadily again. Thanks for all the recent contributions to the site! Statistics: 1364 record labels, 6681 individual records, 5843 images of labels, sleeves, artists, etc. Harry Glenn's Mar-Vel label has been enhanced with many corrections, additions and newly added images thanks to the recent contributions of Paul Solarski with, hopefully, more to come. Watch for many upcoming additions, corrections and previously unseen images of the Cozy label from Davis, West Virginia as well as many other obscure West Virginia additions. Statistics: Slightly more than June 10th but not sure exactly. Thanks to all who emailed and inquired if I had died or why I hadn't updated the site much over the summer. Over the July 4th weekend the hard drive on my computer failed and was unrecoverable. I lost some images and data but the majority of my collected image and sound files (23,000+ files) were safely stored on a separate flash drive. After a week of repairs and reloading software I had a starting point but a long process of rebuilding and synchronizing was still ahead. After 18 months of daily work to create this site and build the databases the loss was mentally overwhelming so I took the summer off from the project and worked on other hobbies & interests which I had neglected for the past couple of years. Now refreshed and excited again I'm ready to get back to work on this site again! Thanks to everyone who sent info, images and sound files this summer! I have 100's of new listings and images to add to the site ASAP. Statistics: 1350 record labels, 6642 individual records, 5771 images of labels, sleeves, artists, etc. Labels with significant additions of listings, images or other data: Adco, Cherokee, Excellent, Foggy, Janet, KYVA, Mar-Vel, Note, Raines, RCM, Red Bird and Staff (IN). New local labels include: Bubbles, Kris, Lanco, Ram-Rod, RMT, Scholl, The Cobras IV. Pertinent out of area labels added recently are: Belva, Cash, Cha-Tok, Circle D, Dor-Cee-A, Ecco, FHR, Flash, Harvey's, K and M, Northway, Piedmont, Rebel, Re-Echo, Skylark, Stonehenge, Tidee, United Union, Universal Sound and Yale. Thanks again for all your emails, interest and contributions. Thanks to all of you, this site has become a true community effort! It is FAR from complete so watch it continure to grow. Statistics: 1323 record labels, 6531 individual records, 5575 images of labels, sleeves, artists, etc. The database continues to grow steadily as new information continues to be generously contributed by many of you and on-hand records and information are still being added to the mix of local labels and local pressings documented here. This is an amazing collaboration and one that has surpassed my expectations a long time ago. Thanks again to all the individuals listed on the home page of this site for their generous contributions of time, effort and expertise to make this data as complete and accurate as possible. Thanks again to contributors, visitors and anyone who is reading these words! Statistics: 1274 record labels, 6389 individual records, 5398 images of labels, sleeves, artists, etc. The weather's getting better and I'm taking a little time and going outside once in awhile but a lot's been added in the last 10 days. New OH, IN, KY & WV labels added include: A & R Productions, ASG, BFB, De-Lemon, Disc Masters, Help!, Nation Wide, June Recording, Louisville, Miracle (KY), Reegal, Scitsur, The Soul Sounds and Twang. New labels added outside of the 4 state area include: Acid, B-G-C-B, Eastern, Franchel, Hyde Park, Jon-Don, Lectron, Outlaw, Pla-Mor, Plaid (NC), Silver Dollar and Single B. Significant additional listings, images or information has been added to Amp, Carnival, Lee, Tammy and Tilt. Also, modifications have been made to the database to finally get the PRP (Precision Record Pressing) discography to display in correct chronological order. The dating info for these listings has also been corrected as more information has come to light. Thanks again for your contributions and interest! Statistics: 1248 record labels, 6324 individual records, 5234 images of labels, sleeves, artists, etc. New local labels added the last few weeks include: Amway, Anbee, Backstage, Basic, Big Russ, Bridges, Buckeye Swift Homes, Cashmere (KY), Christmas Bells, COR, DeBrossard, Delcrest, DLS, Eastern, Empire, Everett Pauley, EVI, Fairdale, Golden Moon, Gray-Bo, H-H, Halt, Holly, Jack Kitchen, Jimbo, Lu Sound, Marbone, Marcum Quartet, Minco, MMP, Our Bag, Plaid (OH), Postscript, Rama (KY), Refreshment, Rondo, Scotch, Smart, Sons Of Zion, Soul Blvd, Spiral, Squire (WV), Star, Stone, Talun, Tara, Taystee Twist, The Gospel Light, Tolou, Trump, Union Jac, VPR, Walbro, Wes-Virginia and WINN Radio. New labels from outside of OH, IN, KY or WV include: 5 Notes, American Artist, Big Star, Blackfoot, Dis-Co, Hit, Kinzua, Shiloh, Singing Wonders, Tradewinds and Wenlark. Existing labels with significant additions of listings and/or images: Alta, Alvic, Ban Com, BES, Blue Angel, Boss, Claudette, Coast To Coast, Farrall, Goldenrod, Jam, Joni, Kernel, Lemco and Top Dog. Wow! Contributions to the site of additional listings and images (and many corrections) were at an all-time high last month! Thanks to everyone for your interest and enthusiasm. I have 100's of images and listings to add plus my own stuff I haven't gotten to yet. Watch for lots more to come in the next few weeks! Statistics: 1184 record labels, 6138 individual records, 4740 images of labels, sleeves, artists, etc. The discography of Rite Custom Pressings (CP) is now over 2100 listings and is one of the largest available on the internet. It is also in a database format so it is searchable and easily sorted by artist, label, matrix number or account numbers. Accuracy is a high priority and the data is supported by nearly a thousand label images. Of course, this represents only one tenth of the total output of Rite pressings over it's 30 years of production! Local labels (OH, IN, KY, WV) added recently include: Baker, Bock, Brite-Star (OH), Checkerboard, Cherokee (Akron), Cin-Town, Denim, Derby-City, Glory, Strand and VR. New labels from other parts of the country include: Acquarian, Bango, Bat, Becco, Brosh, Canon, Capitol Star Artist, CARS, Chick's, Clix (MI), Country Gospel, Dan-Dee, Deb, Dianne, Flask, Frontier, Goodie, Jamack, Joey, Lake Land, Lark (MI), Lark (VA), Laurel, Leon, Lynn-Lee, Neale, North Shore, Owe Man, Pitch, Rascal, Shippings, The Esquires, Tropical, Velvet and Wayne-Way. Use the Label Search feature to easily find the labels listed above. In addition to the new labels above, additional listings and images are constantly being added to existing labels. Data (artist, pressing plant, song titles, etc.) is constantly being refined and corrected as well. Contributor acknowledgments are now listed on the home page. Thanks again for all recent contributions! Statistics: 1140 record labels, 6010 individual records, 4604 images of labels, sleeves, artists, etc. The listings outlined above are complete and label photos will be added steadily over the next couple of weeks. If you have a collection of Rite releases or other research materials please send me any missing information. If you have conflicting information I will be happy to review that also, however I have reviewed and eliminated a lot of conflicting data already to publish the current listings. Thanks again to all who have sent additional labels, listings and label photos recently. They will all be posted shortly. Statistics: 1138 record labels, 5731 individual records, 4493 images of labels, sleeves, artists, etc. Been working on a special project lately that I've been putting off for a long time, Rite's better known house labels - A Gateway Top Tune (Top Tunes - Parade Of Hits) and Big 4 Hits. The Gateway label (1953-1958) is in the standard single format and runs from issue # 1050 to 1253 before becoming Coast To Coast Parade Of Hits (plus other names) after moving to Philadelphia, PA. Earlier releases appeared on the "Top Tunes" label. Later releases were issued on both the "A Gateway Top Tune" and "Gateway Parade Of Hits" labels. Many if not all of the latter issues appeared on both labels at the same time. Big 4 Hits label was issued by Rite as an Extended Play series and ran numerically from # 10 to 236. Rite sold the labels to a company in Philadelphia at about Gateway 1214 and Big 4 Hits 217 although the records were still manufactured by Rite. Most of the songs were released on both the Gateway and Big 4 Hits labels at about the same time. I have extensive but not quite 100% complete information on both labels. I should have all available data on the website in another week. I'll make a note here when I run out of info and need help from all of you - Thanks! One other interesting addition is a very rare copy of Lattie Moore's 1st recording on the Arrow label from Indianapolis, Indiana in 1951. It is a hot country boogie tune entitled "Married Troubles." I need to get audio clips on soon so you can here some of this stuff! Statistics: 1135 record labels, 5474 individual records, 4418 images of labels, sleeves, artists, etc. Rite Records discography is now at 1981 listings and will be over 2000 shortly. Have data on-hand to take to 2500 plus. Local labels (OH, IN, KY, WV) added recently include: Beast, Big I, Bob-Joy, Ci-Sum, Commercial Features, Dee-Lark, Delightful, Future Talent, Jay-Em, Lamia, Ma Be, Pierce, Piper (KY), Ray Beach, Siesta and Vantone. Local labels with significant additional listings or images (or both) include: Acme, Afco, American, Blue Jay, Bonanza, Bonnie, Farrall, Jewel, Poor Boy and Wonder. New labels from other parts of the country include: BEP, Boney, Bonita, Bristol, Boots Hanner, Carl, Chrome, Coe-West, EDA, Ferncreek, Moon, Nicktone, Northland, Ozark (NC), Reynaud, Ricare, Richtone, Sonnic, Soul (OK), Swingtown, Topp-Ett, Top Hat and Wa-Mo. Go to Label Search to look these up. Thanks again for all the submissions of labels, listings and images for the database! Due to the large quantity of recent submissions, I apologize that I am getting behind in posting recent additions. I appreciate all submissions and I promise I will get them all posted even though somewhat delayed. Statistics: 1105 record labels, 5379 individual records, 4298 images of labels, sleeves, artists, etc. It helps clarify and define what this is all about. Also made some changes to the drop down menu listings. More info soon. Statistics: 1092 record labels, 5333 individual records, 4236 images of labels, sleeves, artists, etc. A year ago I had estimated that 5000-6000 listings was pretty much all I knew about the records of this area and the releases by Rite, King, QCA, etc. pressing plants. However, once the ball got rolling, so many of you have made significant contributions that this project is probably little more than halfway with the information currently at hand. Again, thank you to all who have contributed great or small to made this source of information the best possible for the collector of American styles of music. New local labels added since the last posting include: Autumn, Brite, Compass, Crutch, Dell, Delta Int., Gateway (IN), HIO, JAR, Jones, Karen, M&M, Music Mountain, Norg, O-Bo, Philmore Sound, Popsy, Pork, Rite, Shropshire, Silver Star, Smiling, Sovereign, Sunshine (WV), TOGY, Western Hills Bandwagon and Whizenglo. New labels from outside of Ohio, Indiana, Kentucky and West Virginia (type them into Label Search to look them up) are: American Artists, Arnold, Avfus, Bow And Arrow, Carrie, Cayce, Cheswold, Crusade, Dapper, Devere, Dial (TN), Diana, Doll, Dora, Dora (VA), DT, Gateway (PA), Gladatone, Glow, Habana, Halmark, Heavens, j e b, Jay-Kay (TX), Johnson Sisters, Lanrod, Lorida, Lucky Seven, Lupine, Meadow Brook, Millage, Monarch (MI), MTW, Northwest Sound, P & P, Pacesetter, Paul Revere, Peep Hole, Pinewood, Redd Hedd, Sapphire, Showboat (OK), South, Spear, Spindletop, Star-Light, Tempora, Testa, Texstar, Trynorr, Waggoner, Winch and Woodard. Let's see how much more we can grow in 2009! THANK YOU! Thanks to contributions, corrections and encouragement from dozens of knowledgeable and enthusiastic collectors, goals for 2008 have been reached. The database is now over 5000 listings! Statistics: 1008 record labels, 5090 individual records, 4006 images of labels, sleeves, artists, etc. New labels added this week include: Four Wheels, Gralind, Jinx, Key-Dee, Kingdom, LaBeat (MI), Lira, Miracle, NOW, RCM, Rome and Starr. Rusty York's Jewel label has been greatly expanded this week with dozens more listings and photos thanks to contributions from many of you including, most recently, Kim Brock. Now over 170 listings and 140+ images, Rusty produced all types of music from country & bluegrass to rock, soul, funk and more dating from the early 1960's through the late 1980's. Check it out! Looking forward to adding 1000's more listings in 2009. Thanks again for your interest and Happy Holidays! Database is now up to: 996 record labels, 4978 individual records and 3884 images of labels, sleeves, artists, etc. I've been adding a lot of images lately which really helps to groom and correct the data. Earlier this year, when I was just starting on this project, I just wanted to get data into the system as fast as I could so the website would start to take shape. Now I'm finding and correcting many typos in artists names, song titles, etc. that may have been a result of that haste. Please feel free to suggest corrections. Your input is always appreciated! Reworked the Excellent label from Cincinnati, Ohio this week. Added several more listings and replaced all 16 previous images with improved images as well as added 24 additional images. 20 of the 32 listings now have decent photos to document them. Thanks go to Al Turner, Michel Proost and Udo Frank for their help with this label. New local labels added this week include a randon mix of stuff: Black Forest, Bert Murray, Captain, Cleveland Robinson Sings, DC Recording (IN), DC Recording (KY), Evana, Forest View, Janey, Jimmy Thompson Music, Nap-Town, Polly Bee, Pro. Recordings and Roosevelt Lee. Labels from outside of Ohio, Indiana, Kentucky and West Virginia can be looked up in the Label Search feature. Here's some that are now in the system due to being pressed mostly by RITE or KING: Air-Loom, Barclay, Breeze, Carellen, Delta, Granite, Happy Hearts, Hornet, JAX, JCD, Jerome, JimSim, Joker, Key (MI), Kiski, Klub, Ludwig, Mag, Marjon, Marlee, Merlene, Mo-Do, Prater, Renauld, Renown, Ring-O, Ronnie, Sky-Hi, Super, Trepur, Varbee, Veking, Vest and Vulco. 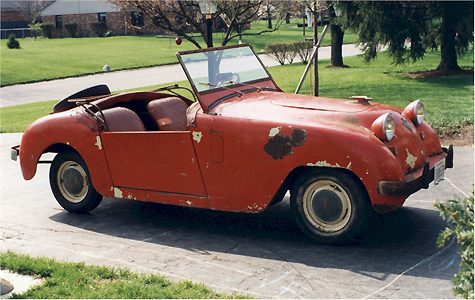 The car pictured below is a 1952 Crosley Super Sport. The car was the brainchild of Powel Crosley who pioneered radio broadcasting with his radio station 700 WLW in Cincinnati. In the 1920's to the 1940's he produced Crosley Radios, TV's and appliances such as the Shelvadore Refrigerators. He also owned the Cincinnati Reds from 1932 - 1961. He made about 80,000 Crosley automobiles from 1939 - 1952. Database is now up to: 972 record labels, 4922 individual records and 3763 images of labels, sleeves, artists, etc. The RITE Custom Pressing listing will pass 1700 total listings today. This is the area I have been working on most over the last two weeks. Most of the new labels and listings below were pressed by RITE. Many of these labels are from outside of the Ohio, Indiana, Kentucky & West Virginia area but are necessary to make the RITE listing as complete as possible. I will also go outside of the area for KING and QCA pressings. Speaking of RITE Custom Pressings, be sure to check the That's All RITE Mama blog regularly for more detailed info on some of the RITE pressings. There's some cool info there! New local labels added recently include: Bonanza (OH), Buckeye, Carr Productions, Cashmere, Dabico, Dip, Double -R-, Gayle, Golden Leaf, Gunn, Gwen, Hollis, Hymn-Time, Janel, Jay Kay, Jean Thomas, Knap Town, Laurel Leaf, Link, Loren, Lucky (Adco), Marshall, New Colony, Piper, Queen, Twin-Spin. Thanks again for all of your contributions - images, listings, corrections, emails with ebay finds, etc. Cars, music and girls - that's what guys like! Here's one I drive around occasionally. Can anybody tell me what it is? Hint: It's from Cincinnati, Ohio! Made a significant addition to the RITE Custom Pressing information today. I have posted a couple sample Master Log Pages from the original RITE files. This gives a little clearer insight into their production and delivery time. Here's one from 1975 and one from 1981. Also added the exact date and matrix number where RITE changed from consecutive matrix numbers for each side of a record to one shared matrix number with side A & B denoting the 2 sides of the record. Database is now up to: 923 record labels, 4720 individual records and 3513 images of labels, sleeves, artists, etc. A huge thank you to Udo Frank for sending over 1300 label images last week carefully selected from his incredible collection of images. Along with the images were many corrections and additions to the existing data. Many of the images were records I had never seen before so more additons and corrections came from seeing the photos. I have only had time to add about 120 of his images so far so many more will be added in the near future. Rusty York's Jewel Recording Studios was auctioned off at the end of October. It looks like almost nothing in the 51 year collection was held back as many rare and unique items were sold. I hope some of you had a chance to get a piece of history as I found out after the fact so was not able to bid. Please click here for the story and auction results. New labels added this week include: Bon-Win, Casey, Colyer, Country Corner, Evans, Hillside, House Guests, QCA, Spinner and Verann. Labels with significant additions of listings or images include: Cee Gee, Goldenrod, M and J, M Records, Southtown, Summit and Toy Tiger. Many additional images and listings from across the country have been added to the Rite Custom Pressings listings also. Database is now up to: 912 record labels, 4620 individual records and 3315 images of labels, sleeves, artists, etc. Rite pressings are now at 1506 listings and growing steadily thanks again to Michel Proost, Malcolm Chapman, Step Baker, Udo Frank & others. Many of the new additons include photos. Over 200 new photos have been added so far this month. Current labels with significant additional listings and/or photos include Rusty York's Jewel label (thanks to Matt Baker again! ), Adco, Admiral and Blue Eagle. New labels added since the last posting include: ASR, Awake, Bo-Ka, Bonnie, Conn, MJW, Parr, SIR, Skifful, Triple A, Triumph (OH), Triumph (IN), Tuff-Nuff, Twilight (OH), Twin, Unicorn, USA, Valli, Vetco, Velvet Inc, Wife and Your-Pick. Be sure to check out the new Rite Custom Pressings Blog - That's All RITE Mama - obscurity at it's best! Friday, October 31, 2008 - Happy Halloween! Database is now up to: 868 record labels, 4468 individual records and 3105 images of labels, sleeves, artists, etc. Worked mostly this week on documenting and adding to the listing of RITE Pressings. The RITE pressing discography currently stands at 1411 listings but is not even close to complete. It should reach at least 2000 listing by the end of the year. Should have over 1000 record labels in the database by then also. Check out the major additions to Clay Eager's Karl Label from London, Ohio. Thanks, Matt! Also check out these labels related to the Karl Label - Anna May Johnson, Coda, Clay Eager, Crawford Bros and Sunny-Lee. Here's some other labels added since the last posting: Bovi, Hollywood New World, Opus, Roll Call, Seaway, Scoot, Stang, Starrett, Top Hit, Tri City, Unity, Vance, Wright-Tone, W.E.C. and Woody. Database is now up to: 812 record labels, 4280 individual records and 3006 images of labels, sleeves, artists, etc. Great progress has been made in all areas including additional labels, listings and images as well as website improvements. The discography of RITE pressings has grown dramatically and will continue to thanks specifically to contributions from Michel Proost as well as Step Baker, Malcolm Chapman and others. The RITE pressing discography can also now be sorted by Artist and Record Label as well as Matrix # and Account #. Some of the new labels added since the last posting include: B & C, Bluegrass (IN), CEI, Cenna Tawni, Chardo, Clock, Dana, Del-Mar, Edg-e, Enola, Ermo, Essgee, Faux Pas, Geauga, India, Indiana, Kentucky (KY), Knoll, Kondas, Kryslar, Kustom, Marconn, Myth, Now!, Pacer, Pal, Palisade, Pampa, Parade, Partner, Pat, Pearl (KY), Pilgrim, Ran-Dell, Right Now! !, S S S, Shenandoah, Sherman, Shirley, Shoremen, Shorty, Shott, Space, Spin, Stripe, Tel Star, Trusty and Wel Burn. MANY existing labels have additional listings and images. It is not easy to pick them out and list them but a few of them include: Bluegrass (Indy), Elgest, Finch, Jalyn, Jewel, Karl, Kasper, Prix and Whirl. Thanks again to recent contributors including Matt Baker, Step Baker, Andrew Bohan, Malcolm Chapman, Steve Foehner, Jim Gray, Udo Frank, Joel Maslin, Michel Proost & Al Turner. Feel free to join the club and add some info! Database is now up to: 746 record labels, 4093 individual records and 2782 images of labels, sleeves, artists, etc. Wow! Remarkable new information has been added to the website this week. Special thanks to all of you who contributed information recently! Check out the original company materials for the following companies (letterhead); Rite Record Productions, Royal Plastics (King Custom Pressings), Hilltop, Mills/Maarc, (business cards); B & 4, Cabut, V.A.C., (original ads / photos): Athena, Lee, Emerald and Owl. These labels have significant new listings, images and/or artist info: Bramble, Cabell, Canton, Coda, Concept, Esta, Hark, Jalyn, Jewel, Jodda, Johnnycake, Karl, Martin Blue-Grass, Pix, Vangee and Wam. New labels added recently include: Abner, Blugras, Clock, Frolic, Globe Star, Harp, Homestead, KBK, Melody Guy, Nashville North, Out-House, Owl, Peppermint, Rena, Saru, Seven Star and Shaw. Also, many labels and record listings have been added from out of the featured area (OH, IN, KY & WV) as they add to the data on Rite pressings, King pressings, etc. The database is now over 4000 listings! Statistics: 733 record labels, 4006 individual records, 2605 images of labels, sleeves, artists, etc. Database is now up to: 701 record labels, 3824 individual records and 2448 images of labels, sleeves, artists, etc. Database is now up to: 691 record labels, 3679 individual records and 2343 images of labels, sleeves, artists, etc. I believe this is one of the most complete discographies in print or online of Harry Glenn's Mar-Vel, Glenn & H And K labels including a photo and brief biography of Glenn. It contains 137 of Glenn's approximately 140+ releases and lists all Mar-Vel, Glenn & H And K releases combined in record number order. Glenn's unusual record numbering system was mixed between labels while giving a consecutive chunk of numbers to each artist. Listing the releases in chronological order would be more confusing. 683 record labels, 3517 individual records, 2190 images of labels, sleeves, artists, etc. Work on adding new labels has slowed recently as I've tried to keep up with increased submissions from contributors. Your input is highly valued and exciting as I enjoy seeing new labels and releases from this area as much or more than anyone! Contributions are welcome and encouraged, please contact me with any additions or corrections. Of course, a huge thank you to those who are already emailing on a regular basis. Of course, this is just scratching the surface as RITE alone pressed about 20,000 different records during it's 30 years of custom pressing! Look for about 2000 RITE pressings on this website by next spring. Database is now up to: 670 labels (Ohio - 341, Indiana - 97, Kentucky - 76, West Va. - 23), 3459 individual records. This was Mus-I-Col week. Restructured the database to accomodate a recording studio / pressing plant that had records pressed by another pressing plant (Rite) during the first couple years before adding record pressing to their services in 1969. So you can now see the output of the Mus-I-Col Recording Studios separately from releases on the Mus-I-Col label. 2080 images of labels, sleeves, artists, etc. Recent labels additions include: A & B, Acton, ACTS, Country Sound, Double Dee, Emperor (KY), Mace, Q-Cue, Raven, RoX, Roy, Royal, RS, Showboat, Showcase, Ski, Southtown, Staff, Tip Toe, Town And Country, Tuff, Viola, Wildwood, and Wolf-Tex. Also added many additional listings and images to previously posted labels! Database is now up to: 626 labels (Ohio - 318, Indiana - 87, Kentucky - 71, West Va. - 19), 3328 individual records. Unveiled a new look yesterday at the top of each page. Who can name the three artists/groups pictured at right? Labels added since the last posting include: Appro, Beetle, Catalina, Dolphin, Emmes, FD Arnold, Injoy Life, Nassau, Nu Sound, Peck, Plaid, Pla Me, Raven (WV), Red Bird, Redda, Relation, RoJam, SAS, Savage, Sunshine, The Ravens, Three Diamonds and Wonder. Check it out! 1926 images of labels, sleeves, artists, etc. Database is now up to: 576 labels, 3135 individual records. Now over 3000 listings! Thanks again for all your emails and huge thanks to those who have made significant contributions to the site including Al Turner, Andrew Bohan, Reg Bartlette, Udo Frank, Tim Kays, Tom Arkle and many others. The eventual completeness of this site can only be achieved by a shared effort and I sincerely thank those who are sharing from their collections. Summer is here and that means I'm painting the porch, working in the yard and tinkering in the garage as well as digging through records in the basement and typing on the computer. However, progress is still being made not just in new listings but also in updating existing info and adding more images. Labels added since the last posting here include: Campfire, Clay Eager, Jimmie Williams Sings, Komet, LeRoy's, LTD, Maestro, Master, Melody, Midnight (Mansfield), Midnight (Toledo), Midwestern, Perry, Ralph Johnson, Redbug, Revello, River Witch, Pix, Pixie, Simpson and a few others. Database is now up to: 556 labels, 2917 individual records. Database is now up to: 545 labels, 2789 individual records. Busy weekend: added 14 more labels plus completed the Tammy Label with many interesting images. The new labels include: Lawson (Indiana), Lesley, Mir-A-Don, Mac, Mae, Zin-A-Spin (Kentucky), Lanjo, Leaf, Liban, Marylin, Maarc, Mills, Leisure Time and Vous (Ohio). Database is now up to: 531 labels, 2673 individual records. Database is now up to: 525 labels, 2540 individual records. KING Custom Pressings Identification and Dating info is now posted on the website! Although I've collected data and researched this for about 25 years, it is still a work in progress and subject to future tweaking. Check it out and as always, additional information is always welcome! *** This week I added an Alphabetical Artist Listing of all the artists in the database. Now you can look for information by artist, label, pressing plant, musical style, state and more! Saxony is one of my favorite Cincinnati labels. Great vocal harmony doowop (Rollie Willis & The Contenders, Cabarets) and one of the best girl groups ever (Teardrops) plus some soul and garage releases! Gifted songwriter and Saxony co-founder, Paul Trefzger, still has some original releases available plus cool 45 rpm reissues of hard-to-get Saxony favorites as well as unreleased material. CD's are available too! Click Here for a complete discography of all Saxony originals and reissues. Please visit the Saxony Record Company website to purchase Saxony material! New labels added this week include Jodda, Johnnycake, Juke, June, Jurny, JD, JRE, K, K-W, Ken-H, Walton and Dayton's garage and soul label - Prism. I'll be adding more labels this week that start with "K" and "L". Received many more emails in the last week. I've enjoyed corresponding with other researchers, label owners and collectors, thanks! Please remember, this website is still in it's infancy. Over the next year it will expand and improve in many ways. Thanks again for your patience as I continue to add individual releases and labels to the database. The weather is getting nicer and my wife wants me to do something besides type on the computer. In spite of that, there are some interesting additions to the database in the last week. Most significant are Jack Lynch's Jalyn Label and the start of Rusty York's Jewel Label! Jalyn is complete for now and I'll finish the rest of my current data on Jewel this week. Other interesting labels added this week are Fabar, Hi-Note, Hi-Point, Jamboree, Janet, Jerrlen, Jet and Joni. Enjoy! Added 25 record labels in the last week including larger labels like Sun-Ray, R D Globe, Goldenrod, Great Scott, Gregory, Atila, Kim, Island and smaller ones including Randolph, Terry-Gregory, Goldcrest, Gra Low, Saga and Honey. There are now over 1200 local label images including record labels, picture sleeves and photos and I'm still just scratching the surface. Currently working on the more significant labels starting with the letter "J". This week Columbia, Capitol and American Record Pressing (ARP) pressing info was expanded and enhanced. King pressing info has also been percolating in the background and is nearly ready to be posted. Recordwise, added a dozen new labels including; Top Dog, Rene', Skoop, Sparkel, White Star, Buz, Jam, Holiday (Columbus, Ohio), Holiday (KY), Glass City, New Song and Nikko. Fraternity Records is now up to 150 listings and continuing to grow. 100's of labels left to go - I'm having fun, I hope you are! Over the weekend completed Finch and Capsoul, added Fujimo, Flying V, Gary, Plato, Flo-Roe. Sunday morning I found 9 different Capsoul 45's in an odd box in my basement so that info is much improved and lots of pictures added! Indiana's Fujimo label is a special one so I took my time and made it as detailed as possible with lots of photos. Working currently on Cincinnati's Fraternity Label. Lots of great records were released on this label that spanned over 25 years and upwards of 400 releases. I don't know of a definitive discography of this label on the web or in print so check it out as it progresses! This week - completed Blue Onion and Farrall, added - Ebony, Colony, ESV, Emerald, M erald, M Records, Dupree, MC, Glee, DKR, Elysian, Fabar, Falcon, Fan and Fig. A stack of Finch 45's are sitting next to me so they'll be next! Instead of going slowly through the alphabet, I'm switching to working on completing some of the labels that are already on the site and adding major labels that are the most interest. So here's what's happened over the weekend: completed the following labels; Poor Boy, Karl, Yolk and added; Deco, Donna, Name, Olimpic, Note and Tyme. Major labels that start with "C" are in the database so I'm now working on labels that start with "D". The most interesting labels I added or filled out this week are: Emperor, Cozy, Hilltop, Huron and I started on Fraternity. Fraternity will have about 400 listings when complete so for now I listed some of the cool, early ones. Also check out "The History of King Records." Modified the Labels table so the state index pages (OH, IN, KY & WV) now show how many individual listings there are for each label. Not all labels had equal output so this shows which labels issued more records. Added 12 more labels that start with "C" including Clearhill and Counterpart (77 listings!) Should get well into the D's this week. Yes, I do go to work everyday so I can only do this when time is available. I've received a number of very nice e-mails from some of you. A sincere thank you to those who took time to tell me what you think (all positive so far!) Please tell your friends so more may enjoy the information! Took a break from the "C" labels and did Larry Short's Ruby Label from Hamilton Ohio. 40+ listings and nearly 40 photos including a picture sleeve (with no picture) and a photo of Arnold Van Winkle in the Ruby Recording Studio. Check it out! Added 20 more labels, most of which start with the letter C, including these favorites: Capsoul, Cardinal, De'Besth and Cinemasound. Probably have 20 more "C" labels to go before I'm up to the D's. Enjoy! A big snowstorm allowed some extra updating the last couple of days. I added a RITE Discography sorted by Account Numbers. This is interesting as it shows which labels are related. Check it out here! Added over 100 new photos plus added or made major updates to about 25 labels including Carlco, Spangle, Terry, Savoy, Tammy, Clover, Early Bird, Drive, Debonair, Vincent, Vangee, Dani, Dale, Daysel, Dess, Duncan, Tally, Elgest, Claudra, Cherry, Cherokee and more. The ones in bold can be clicked on to go there. The old website used standard HTML and all the pages ended in .htm. The new site depends on PHP scripting so all the pages end in .php. If I didn't preserve the old site it would have no continuity in search engines and basically be a completely new site. I've spent a great deal of time the last few days modifying the old website so people could still find it. Today is the day! I've switched this website over to the new database driven design that's been in development for over three months. I hope you find it interesting, but keep in mind the database is less than 10% complete! Added the following labels: Blue Dot, Blue Giant, Blue Grass Special, Blue Jay, Bobby, Bold, Boone, Bonzana (OH & KY), Boss, Bounty, Bowery, Box, Brock, Bluegrass (IN), Bryte, Buckeye, Bur-K, Burdette, B-W, Blue Onion, Hard Times and Saxony. The ones I like the best are in bold (check out Saxony!) and you can click on them and go there from here. All major labels that start with "B" are now on the website. Over 100 more images have been added! I made one page today but it took all day, it's the Rite company owned labels information. Check it out here. Also I posted a letter to Carl Burkhardt, owner/founder of Rite records from early 1950. This is part of the stuff Carl gave me a long time ago. It's interesting just for being so old! The last few days have been spent getting the website ready to launch. Created new pages and content for picture sleeves, ep's and company sleeves. These have temporary content so they are attractive but will eventually have their own separate databases of information. Also have converted links page, 45 rpm history, RCA record players & individual dating information pages for RITE, RCA, QCA, KING, Monarch, Musicol and RITE's in-house labels to new php scripted pages. Plus lots more details that are too boring to list. Added 22 images and the following labels: Mandingo, B & 4, Ban Com, Baron, Bay Shore, Bel-Kay, Ben, BES, BFM, Amos Johnson, Big Bang, BiM, Blackcrest, Blank and Blue Angel. Added 14 Ohio labels including Early, Eastwood, Harvey, Hilltop (Cin), Jeanie, Lads, Lemon Lime, Oh My, Pattie, PJ, Reese, Shawnee, Sure Play and The Livin' End plus photos for most of those labels. Also completed the Lee label. Completed the Destiny label. Worked on completing the Rite discography through 1960. Major labels that start with the letter A are now on the website.